The Anzisha Prize, an initiative of the African Leadership Academy (ALA) Centre for Entrepreneurial Leadership in partnership with the MasterCard Foundation and the Louis Dreyfus Foundation, is searching for Africa’s next top entrepreneurs. The Anzisha Prize seeks to award young innovators who have developed and implemented innovative solutions to business or social challenges facing their communities. The amount of $75,000 USD will be awarded to winners. The Anzisha Prize is funded by a generous grant from the MasterCard Foundation and the Louis Dreyfus Foundation. You must be between 15 and 22 years old with an ID document or Passport to present as evidence. Anyone born before April 16, 1994 or after April 16, 2001 will not be considered. Individuals who apply must be one of the founding members of a business (for example, 2 or 3 co-founders who started a business together). One person can apply for the Prize, on behalf of the team. Relevance: Has the young entrepreneur identified a clear business opportunity or social need in Africa? Effectiveness: Does the venture created by the young entrepreneur effectively respond to this relevant need or opportunity? Jobs Impact: Has the venture created any jobs to date and does it have the potential to create more jobs with support from Anzisha? Leadership Potential: Does the young entrepreneur have clearly demonstrated leadership potential and an ability to inspire others? Can this potential be accelerated by being part of the African Leadership Academy community? Innovations (businesses, projects, inventions, etc) in ALL FIELDS of study will be considered - including science and technology, civil society, arts and culture, sports, etc. Twelve finalists from across Africa win an all-expenses paid trip to South Africa to be part of a week-long entrepreneurship workshop and conference at the ALA campus on the outskirts of Johannesburg. Each of the 12 finalists receive a $7,500 USD fellowship package with ALA’s Youth Entrepreneur Support Unit (YES-U) which includes the Anzisha Week bootcamp, mentorship and consulting services, travel opportunities, networking opportunities and business equipment. Prize winners, selected from these finalists, share prizes worth $75,000 USD -- the Grand Prize Winner receives $25,000 USD; 1st Runner-up receives $15,000 USD; 2nd Runner-up receives $12,500 USD; and the remaining nine finalists will receive $2,500 USD each. There is additional investment of $8 000/ $10 000 in each fellow. Anzisha Fellows are supported for life as part of African Leadership Academy’s approach to youth development. Winning the prize is just the first step. Thereafter, mentorship, consulting and community gatherings become part of the fellow experience in the years that follow as you and your venture grow from strength the strength. The Anzisha Fellow program will help you become the best you can be! 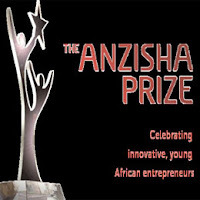 Apply by the 31st of March and win the Anzisha Prize Pack! Early applicants names will be put into a drawing for the Anzisha Prize Pack. ALA will also showcase the selected applicant on its Facebook page to celebrate their work as a youth entrepreneur. Are you ready!? Are you the next Anzisha Fellow!? Then submit your application. Before you begin, make sure you are eligible to enter into this competition. You may submit your application ONLINE on the official website. Note that you can save your application at any stage, and return later to complete the questions. If you need help, email us on prize@anzishaprize.org. It is important to visit the official website (link to it is below) for complete and ddetailed information on how to apply for this award. Semi-finalists will be chosen on a rolling admissions basis, so get your application in early! If you have a very strong application, ALA could be visiting you very soon! Early Bird applications will be reviewed on 15 March 2016, while Application Deadline is on 15 April 2016. NOTE: Apply by the 31st of March and win the Anzisha Prize Pack! You are strongly encouraged to submit your application as soon as possible. ALA cannot evaluate applications that arrive after the deadline. Finalists will be announced in September 2016. And the Prize Week and Awards ceremony will take place in November 2016. If you have questions about the Prize, your eligibility, or the application process, contact the organizers in any of the ways described on the official website eg via social media or email (see official website via link below for more information). All around us, young people are addressing pressing issues in creative ways, resulting in a brighter future for their communities. The Anzisha Prize celebrates their initiative and seeks to encourage others to follow in their footsteps – creating a movement of young entrepreneurs who will shape the 21st century.